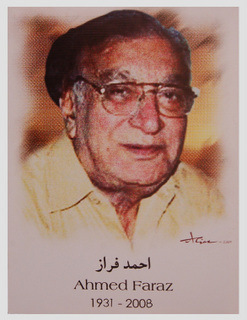 Ahmad Faraz (Urdu: احمد فراز‎, born Syed Ahmad Shah (Urdu: سید احمد شاہ‎) on 12 January 1931 in Kohat, died 25 August 2008) was a Pakistani Urdu poet. He was acclaimed one of the modern Urdu poets of the last century. ‘Faraz’ is his pen name, (in Urdu takhalus). He died in Islamabad on 25 August 2008. He was awarded Hilal-e-Imtiaz, Sitara-i-Imtiaz and after his death Hilal-e-Pakistan by the government. Faraz has been compared with Faiz Ahmad Faiz, holds a unique position as one of the best poets of current times, with a fine but simple style of writing. Even common people can easily understand his poetry. Faraz was arrested for writing poems that criticised military rulers in Pakistan during the Zia-ul-Haq era. Following that arrest he went into a self-imposed exile. He stayed for 6 years in Britain, Canada and Europe before returning to Pakistan, where he was initially appointed Chairman Pakistan Academy of Letters and later chairperson of the Islamabad-based National Book Foundation for several years. He has been awarded with numerous national and international awards. In 2006, he returned the Hilal-e-Imtiaz award he was given in 2004. He claimed his current writings and said: “I now only write when I am forced to from the inside.” Maintaining a tradition established by his mentor, the revolutionaryFaiz Ahmad Faiz, he wrote some of his best poetry during those days in exile. Famous amongst poetry of resistance has been “Mahasara”. Faraz was also mentioned by actor Shahzada Ghaffar in the Pothwari/Mirpuri telefilm “Khai Aye O”. Faraz died of kidney failure in a local Islamabad hospital on 25 August 2008. His funeral was held on the evening of 26th, by many admirers and government officials at H-8 Graveyard, Islamabad, Pakistan.